Ḥadāʾiq al-azāhīr fī mustaḥsan al-ajwibah wa-al-muḍḥikāt wa-al-ḥikam wa-al-amthāl wa-al-ḥikāyāt wa-al-nawādir / lil-qāḍī Abī Bakr Muḥammad ibn Muḥammad ibn ʿĀṣim al-Andalusī al-Gharnāṭī. The McGill University library respects intellectual property rights as they apply to copyright holders and the public domain. Our use of the material we post is governed by the Canadian Copyright Act and considers both the copyright status of individual works as well as provisions for fair dealing. Your use of the material we post is governed by the same. The McGill University library holds a large number of items that are still under copyright protection, some of which may appear on this website. In most cases where copyright exists in our collection, we are not the copyright holder, nor do we necessarily know who is. We indicate what is known about the copyright status of an item on the item record. As there are many factors involved in determining the length and applicability of copyright protection, this will not always be possible. In all cases, it is up to you, the user, to secure any necessary permissions to use or republish copyrighted material found on this site. If you can clarify the copyright status of a particular work, or if you believe that your copyright has been violated by material available on this website, please contact us. We make this content available on the condition that users credit the McGill University Library when reproducing content from our site. Giving credit promotes good scholarship, and helps others find the original source material. Title. Date. Publisher. McGill Library Islamic Lithographs Digital Collection. URL. Web. [Date retrieved.] PDF file. al-Ḥirz al-maknūn min lafẓ al-maʿṣūm wa-al-maʾmūn. 1290 . Bhūpāl : [al-Maṭbaʿ al-Siddīqī]. McGill Library Islamic Lithographs Digital Collection. 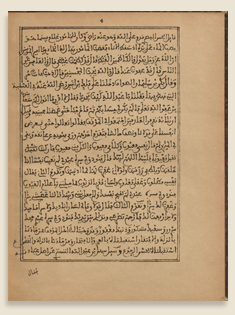 http://digital.library.mcgill.ca/islamic_lithographs/fullrecord.php?ID=10809. Web. 25 April 2016. PDF file.